International travel can leave modern-day adventurers with positive memories and increased knowledge of their world. Along the way, many pick up souvenirs, gifts, and other items that remind them of their favorite destinations. Regardless of what travelers bring home or choose to leave behind, everyone still has to answer to customs officers upon arrival into their destination country. No traveler enjoys clearing customs: In addition to filling out the standard form on the incoming aircraft or vessel, travelers may be asked to recall everything they picked up and packed on their travel. In the United States, the pass-through customs is often followed by passing immediately through a Transportation Security Administration (TSA) checkpoint. When prepared for and done correctly, passing through customs can be a relatively quick and easy process. Here are five common questions every traveler should always plan on being asked by a customs officer upon arrival. 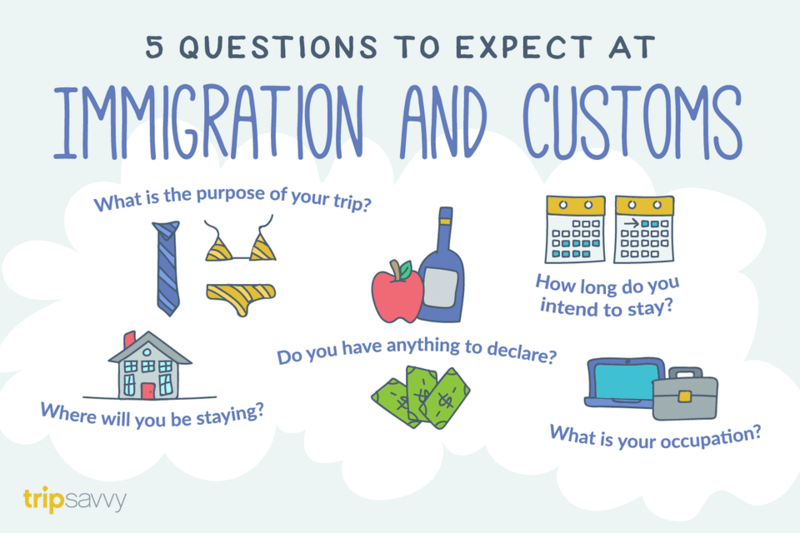 In nearly every situation, this is often the first question travelers will be asked by a customs officer. This is often the first of the most common customs question because the purpose of a trip could change the type of visa required for entering the country, or subject travelers to different regulations. As a matter of best practice, always be honest with customs officials about the purpose of a trip. A dishonest answer could result in detention or even expulsion from a foreign country. To be safe, be sure to look up visa requirements before your arrival to ensure a smooth transition at customs. This common customs question has less to do with a traveler's vacation plans, and everything to do with national security. Customs and border protection officers often ask about the length of stay to assess if travelers qualify to enter the country, and if the visa they are holding is appropriate for their stay. While some countries allow for a 90-day stay with an on-arrival visa, others require travelers to apply for their visa well in advance. Depending on the planned length of visit, savvy travelers should be prepared to explain the length of their visit. Short-term stays of less than a week and long-term visits of more than a month usually receive a follow-up from the customs officer about their activities during their visit. Smart travelers should always prepare to answer truthfully about their activities while traveling. Unlike the first two questions, customs officers often ask about housing arrangements to ensure a traveler is not a security risk. Travelers giving very generic answers including "at a hostel," "with a friend," or "at an Airbnb" may raise red flags for officers. As a result, travelers may get even more questions about their visit and could be detained until their travel plans are verified. Smart travelers prepare an answer to this customs question with the name of the hotel they are staying at or the address of the friends, family members, or Airbnb property they will be staying with. In addition, those who are planning to stay in a hotel or hostel should always keep confirmation of travel plans available. Having detailed stay information on hand can help travelers clear customs faster and with less frustration. This common customs question has less to do with a fascination of global occupations, and more to do with analyzing risk. When a customs officer asks about a traveler's occupation, it is not only an indicator of their financial capacities while in a given country, but also a behavior analysis tip. Travelers who cannot give an answer quickly or directly may be directed to additional questioning by customs. Smart travelers answer the occupation question directly and quickly. However, be prepared to back up those answers with additional proof. Certain occupations (like "journalist" and "law enforcement") could result in follow-up questions. Some embargoed goods may also not be brought back, depending on the country. For travel into the U.S., this includes many items originating from Cuba, Burma, Iran, or Sudan.​ Always keep a list of your items purchased on your person when going through the checkpoint, and be sure to declare all goods purchased abroad that you are bringing back with you. Planning to speak with a customs officer is never fun, but it's a vital part of any international itinerary. By having answers prepared about a trip, every international traveler can make sure their stop is quick, efficient, and allows you to enter the country without delay. How bad will the #BrexitVote hurt international travelers?